Granted, the most authentic part of this Yucca Valley castle seems to be confined to the "castle room." The rest looks like a standard-issue rental home, complete with a media room, shiny bedspreads, tennis court, tanning bed, a pool, and so much more. But back to the "castle room." 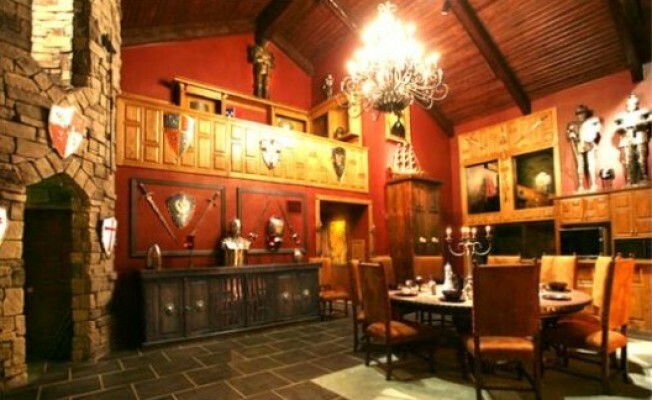 Throw in some candles, goblets of wine, shanks of ham, and a few wenches, and you could live out your medieval fantasies. These people sure did. The home rents for $1,950 per night on the weekends (cheaper during the week ) and sleeps up to 15 people. According to the web site, the home is located about 25 minutes from downtown Palm Springs and ten minutes from the gate of Joshua Tree National Park.